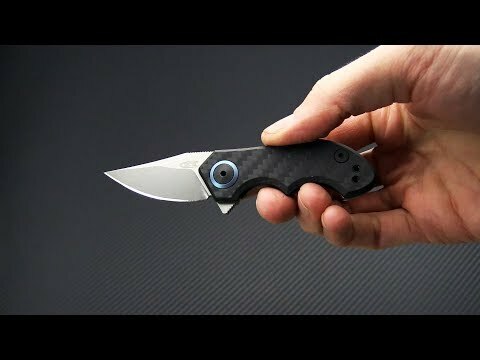 Zero Tolerance Knives and Tim Galyean teamed up to introduce an ultra-compact and equally badass micro flipper to the market. The ZT 0022 measures in at just 5.75 inches overall making it a perfect gentleman's mini tactical carry for office or casual attire. Features a carbon fiber front side, titanium frame lock back and CPM-20CV blade. Despite its small stature, this flipper walks and talks just like the big guys. 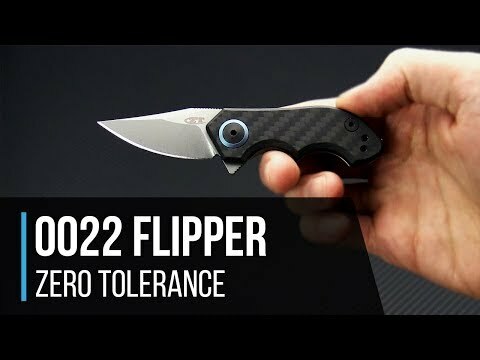 Brand new directly from Zero Tolerance Knives. The Blade: Measuring in at 1.8 inches, the blade may be little but is also fierce. The clip point design offers a nice pointy tip for delicate tasks while the belly of the blade is more than capable of everyday slicing. Riding on a KVT ball-bearing system, the blade can be quickly deployed with a flick of the flipper tab. Given the wee size, the flipper tab also acts as a partial choil/guard when in the open position to protect finger slippage onto razor sharp blade. Jimping is also found along the flipper tab and spine of the blade for added control where you need it the most. The Handle: Aggressive finger grooves are the highlight of the handle providing a comfortable and secure two finger grip. The front side of the handle features attractive carbon fiber with decorative blue pivot collar while the Ceramic Blast Ti backside is a beefy little frame lock with steel lockface insert. A single blue barrel spacer secures the handle and may also act as a lanyard attachment to extend the grip into the palm. Black hardware accents and reversible tip-down carry clip finish this piece off.